1825 – James Craig, Brick and Tile Maker, Nether Commons, Paisley. 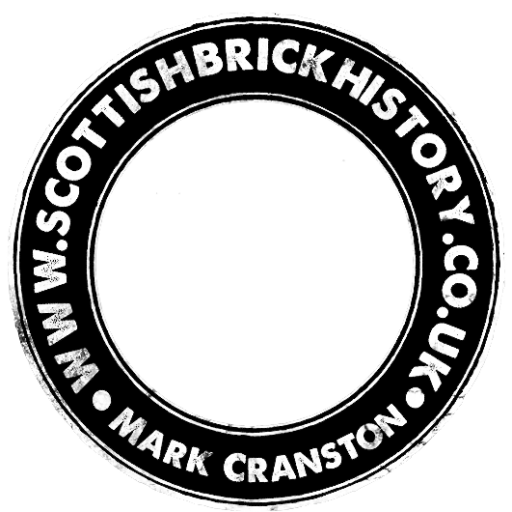 Below – 05/01/1846 – Glasgow Herald – Notice to persons having a claim against the late Mr James Craig, brick and tile maker, Nethercommon. 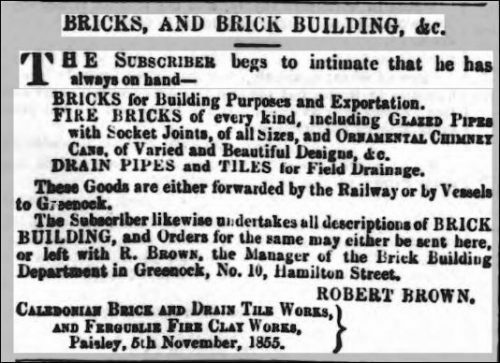 13/01/1846 – Greenock Advertiser – Brick and Drain Tiles – The Subscribers have for sale a quantity of bricks and drains at their Works at Caledonia Street, Paisley where the manufactory of these will continue as heretofore. James Craig & Co, Brick and Drain Tile Works, Caledonia Street, Paisley 09/01/1846. 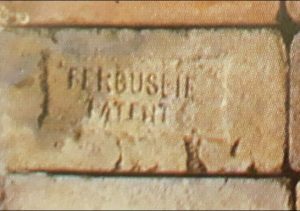 20/07/1847 – Edinburgh Gazette – Notice is hereby given, that David Murray, Painter in Paisley, has applied to the Commissary of the Commissariot of Renfrew to be decerned and confirmed Executor Dative qua Creditor to the deceased James Craig, Brick and Tile Manufacturer in Paisley, and residing at Nethercommon there. Robert Rodger. Agent. Paisley, July 17, 1847. 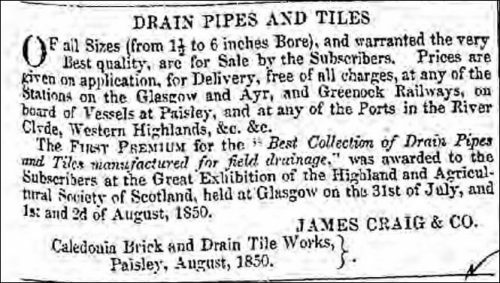 Below – 06/09/1850 – Glasgow Herald – Advert for James Craig & Co, Caledonia Brick and Tile Works, Paisley. 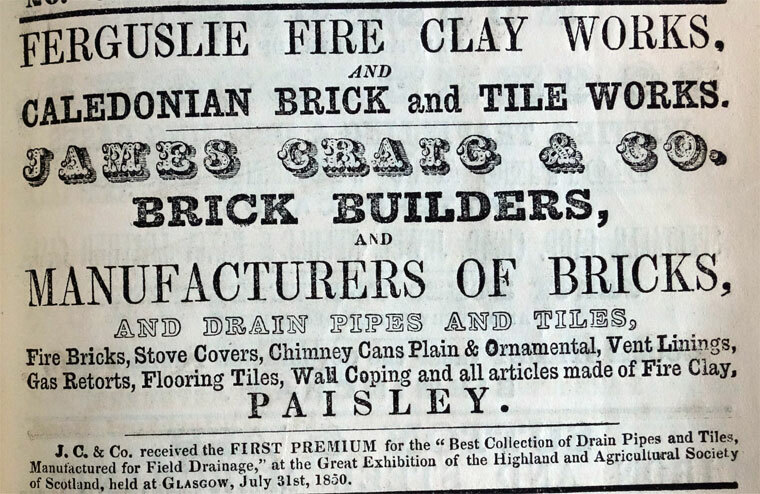 28/06/1852 – Glasgow Herald – Advert for James Craig & Co, Caledonia Brick and Tile Works, Paisley. 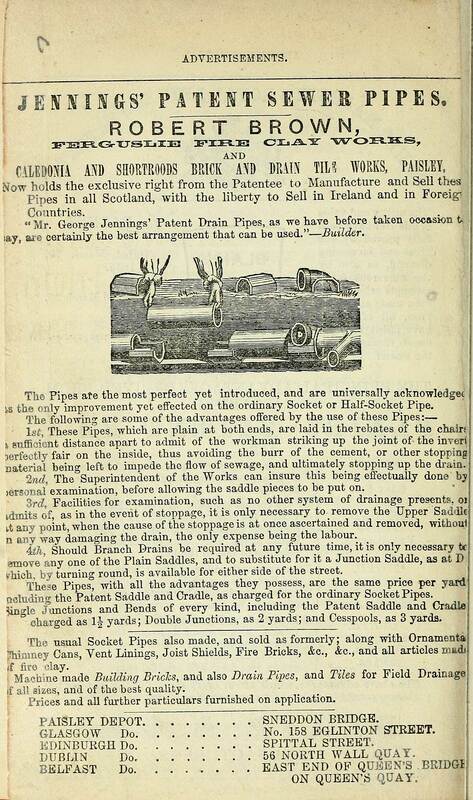 Below – 13/01/1854 – Advert Robert Brown, Caledonia Brick and Drain Tile Works ( Formerly James Craig and Company). 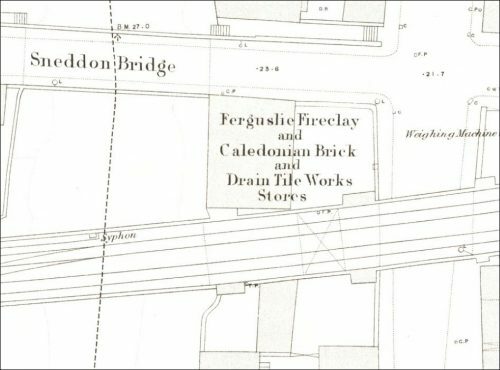 1855 – 1856 – Scotland Places – Very extensive Brick and Drain Tile Works, with the usual Drying Sheds, Kilns, etc. Attached, Situated off the Greenock Road and north of Caledonia Lane, Bricks and Tiles etc. of all Sizes and patterns and manufactured at these Works. The Property of the Burgh of Paisley. Robert Brown Esq the Present Provost of Paisley is Occupier. 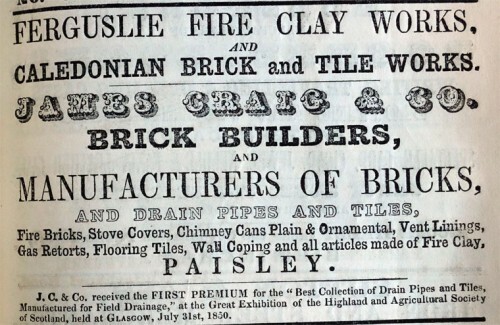 26/07/1856 – Paisley Herald – I pay Robert Speirs and Thomas Ward, tile moulders their wages daily or hourly if required. 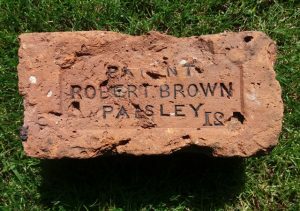 Robert Brown, Caledonian Brick and Drain Tile Works, Paisley . Below – 05/03/1858 – Glasgow Herald – Robert Brown advert. 14/08/1858 – Paisley Herald – Deaths – At Caledonian Brick Work, near Paisley on the 7th inst, Mr Andrew Craig, Manager aged 56 years. 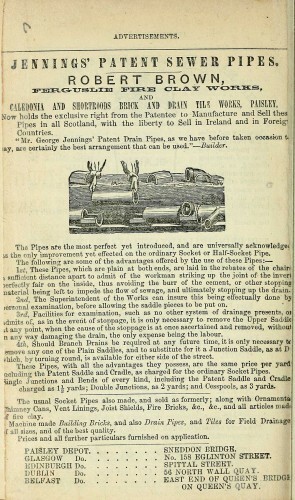 Below – 1862 – 63 – Advert Robert Brown – Jennings patent sewer pipe. Previous Article Lee Terracotta Works, Braidwood, Carluke, South Lanarkshire. 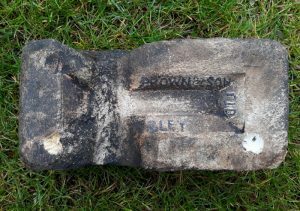 Found by Ian Suddaby on the River North Esk, Dalkeith. Robert Brown & Son, Ferguslie Fireclay Works, Paisley, Renfrewshire The LTD on the end of the frog is unusually positioned and in mirror image. The brick has also been modified to allow a shaft, Water pipe, electrical conduit or metal bar to pass through it…. Photograph depicted in a book entitled “And so we graft from six to six” by Warwick Gemmell. 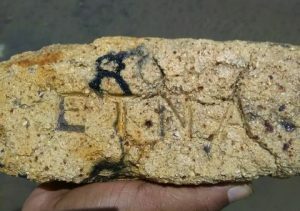 This brick was found in New South Wales, Australia. I am not in possession of this brick. 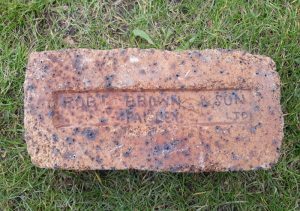 Robert Brown & Son, Ferguslie Fire Clay Works, Paisley. . .
Found by Willie Guthrie om the foreshore of Loch Lomond, Balloch Country Park, West Dumbartonshire. Patent Robert Brown Paisley 12 or 21. If it says 12 then both numbers are back to front. It could also be a reversed 21. 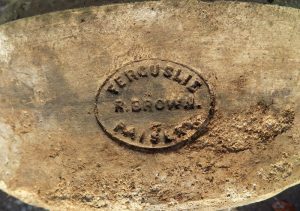 Robert Brown & Son, Ferguslie Fireclay Works, Paisley, Renfrewshire. . . . .